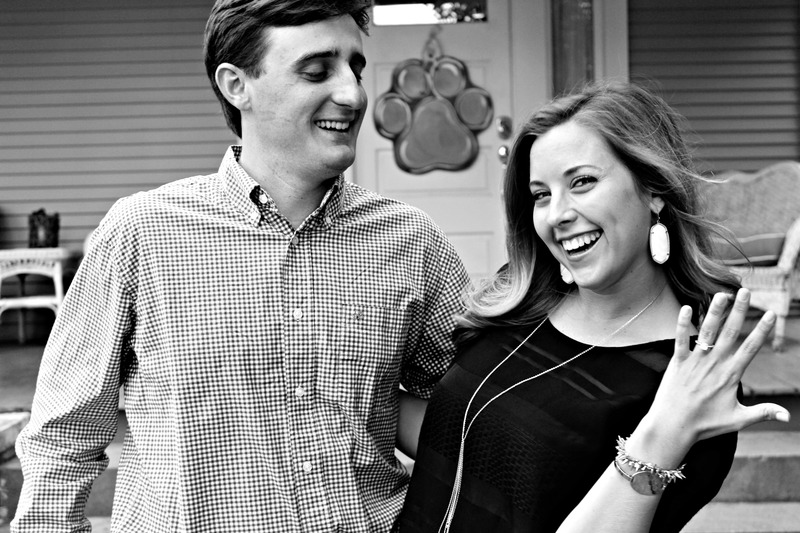 These kindergarten besties turned LSU tigers have watched their love grow for over a decade! 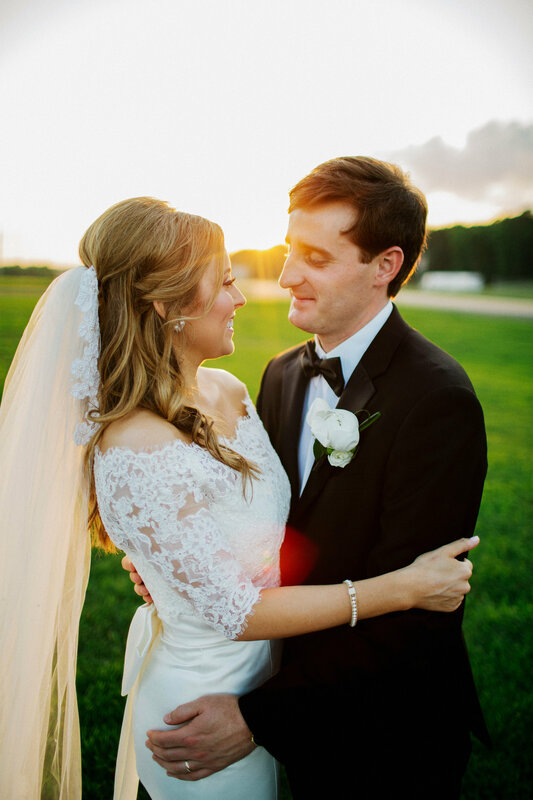 Their Louisiana wedding is so stinkin' cute, we can't even handle it! We've best lost in it since we've seen the pics... now it's your turn! Geaux for it! Andy and I actually met in Kindergarten. It’s funny; we both grew up in the same small town of Ruston, Louisiana and attended a small private school from K-12 called Cedar Creek. We have been in the same class since we were 5 years old! Of course, I knew who Andy was, but I didn’t notice him until our class took a trip to south Louisiana in the 8th grade. He was my partner for a card game we played to pass the time on the bus. The summer after, he began messaging me on MSN Messenger… silly, but I guess that’s how you played the game back then! We began dating our freshman year of high school. Andy is very athletic and super smart! He was always good at every sport: the quarterback, point guard, and pitcher! I, on the other hand, stuck to dancing, herkies and pyramids! There were some ups and downs here and there, but when college came around we chose the same school, LSU in Baton Rouge – Geaux Tigers! We decided to keep our relationship going and if it worked, it worked, if not, well, I’m not sure… because it worked! We both finished at LSU and now live in Shreveport, Louisiana. I am one that is hard to surprise. I know everything. I knew that if Andy was going to ask me to marry him, I was surely going to know that it was about to happen. I guess after dating for 10 years, he figured out how to trick me! It was June 12, 2015. My best friend at the time was in OT school and her boyfriend had driven in from Baton Rouge for the weekend. We were supposed to go out to dinner, but about 15 minutes before we were supposed to meet, she called me in a panic. Her sweet boyfriend, now fiancé, had “forgotten a nice, button down polo” which was required for the restaurant we were going to. She was upset and convinced me to run to the mall to find him an appropriate shirt. I might have rolled my eyes a few times, it was Friday night in Louisiana and all I wanted was a cold glass of Pinot! But, of course I went with her! We went to the mall, bought him a shirt, and when we got back she dropped me off at Andy’s. She was going to run the shirt home to him and we would meet at the restaurant. Well, when I got to the door, there was a letter explaining how much he loved me and how much our relationship had meant to him for many years. As I opened the door, there were hundreds of pictures we had taken through the years and flowers all through the house leading me from the front door to the back. I was shaking by the time I had reached the back door. There he was on the back deck waiting for me! A huge part of our relationship is our sweet black lab, Tiger, (crazy LSU fans) and she was standing right next to him! Kind of cheesy, he was wearing a Go Pro around his body, haha, but he wanted to capture every moment! He then got down on one knee and asked me to marry him! My friend knew everything that was happening; she had actually thrown her car in park, grabbed her camera and ran in her wedges around to the back yard to capture some sweet moments of him proposing! After he proposed, we hugged and kissed, and as I went to pull away, my necklace got wrapped around the Go Pro, so we were literally stuck for 5 minutes trying to untangle it… haha this describes us perfectly. Venue was probably the hardest decision I had to make. 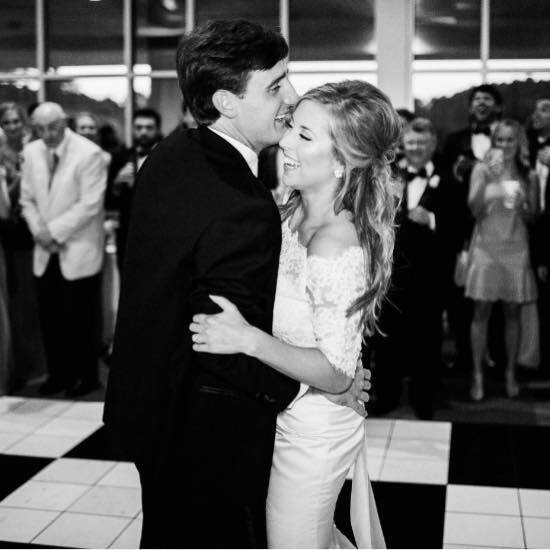 Ruston is a small town and there are not that many options for a wedding venue to host 450 guests. My parents live in a beautiful older home with a huge front and back yard that was built in the 1930's. I had always imagined having my reception in the front yard at their house. Ironically, I was a flower girl in a wedding that was at my parents’ house, before they bought it! 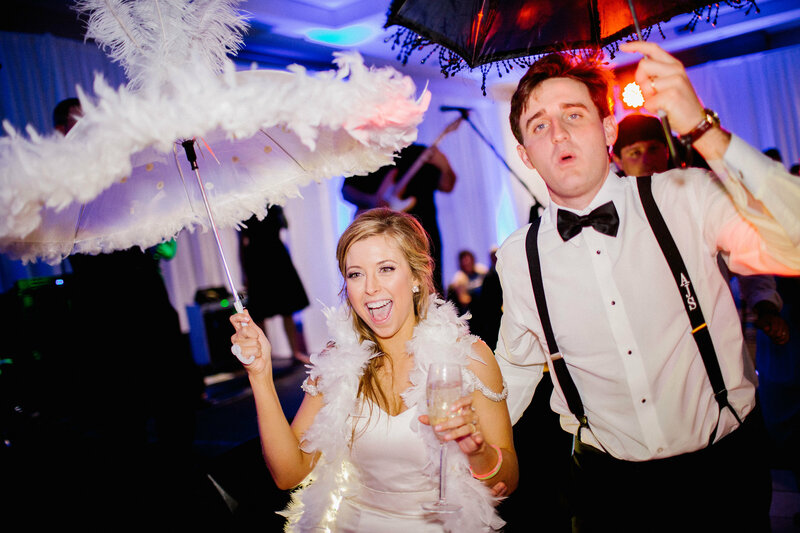 But, getting married during the month of April, outside, in Louisiana, can cause a lot of concerns. I had pondered and pondered for months, and finally decided I had to be realistic with myself. I was SO worried about rain, I mean tent or no tent, it rains every other day here during April. The ground was never going to be dry. I just couldn’t imagine my friends walking around in stilettos with their heels sinking every step! If I wanted to be calm, comfortable, and enjoy my wedding day I had to find a better choice. We had actually booked another venue as our back up in case of rain, so I just decided to go with that venue as my first choice! This was decided the week I had the invitations done. I actually had them change the location right before they were sent through the printer! I have to admit, although it was a hard decision, I am SO glad I decided to change to an inside location, I definitely slept better every night after that! 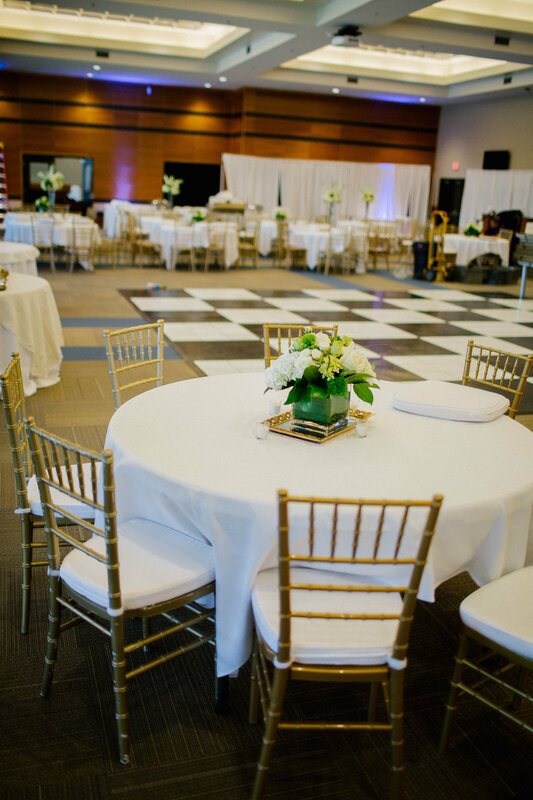 The Davison Athletic Complex is a brand new facility and we were the very first wedding held there! Louisiana Tech University is in our small hometown of Ruston. They had just made an addition onto their fieldhouse that included a ballroom and overlooked the football field. It was super cool and turned out to be wonderful. Air conditioning, plenty of seating, and the staff there worked so hard to make it perfect being that it was their first wedding! I got so many compliments on how cool of a venue we chose! 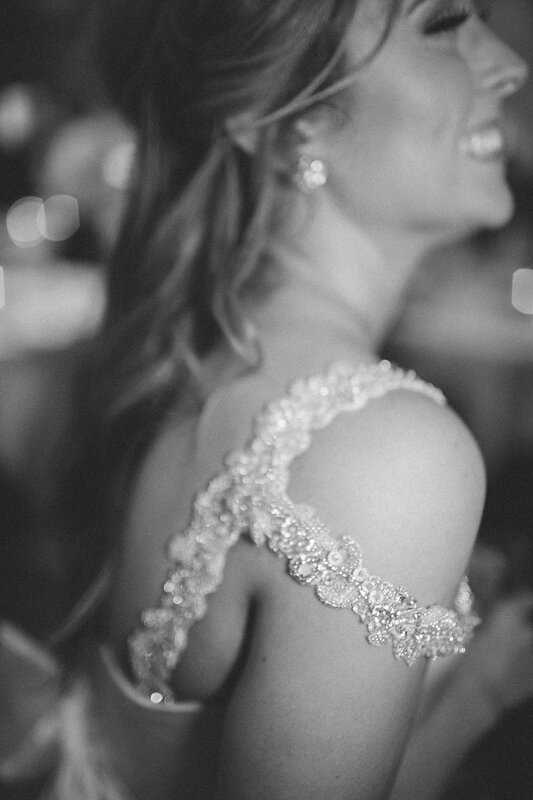 My dress was designed by Stella York! I added a few accessories to make it something I knew no one else would have! I had a big bow made, wore a lace bolero for the ceremony, and some fun blingy straps so I could dance the night away at our reception! I went to three bridal stores. I was so against getting my dress at a local store. I wanted to go to a big city and find it! But, after visiting two stores in big cities and having no luck, my mom convinced me to “just go look” at the store in Shreveport. I did, and of course, that is where I found it! Happily Ever After Bridal is the name of the store. Their service compared to both stores in big cities was second to none! They were great and treated me like a princess. Because I added accessories to my dress, I had to have LOTS of alterations done. This is why I am SO glad I got my dress locally. I had about 6 different alterations appointments before it was finished. God bless Mrs. Wanda, the seamstress at the store. She did amazing work and made my dress exactly how I had envisioned it! I wanted a theme of tradition and class! Hydrangeas and a black and white dancefloor were a must! 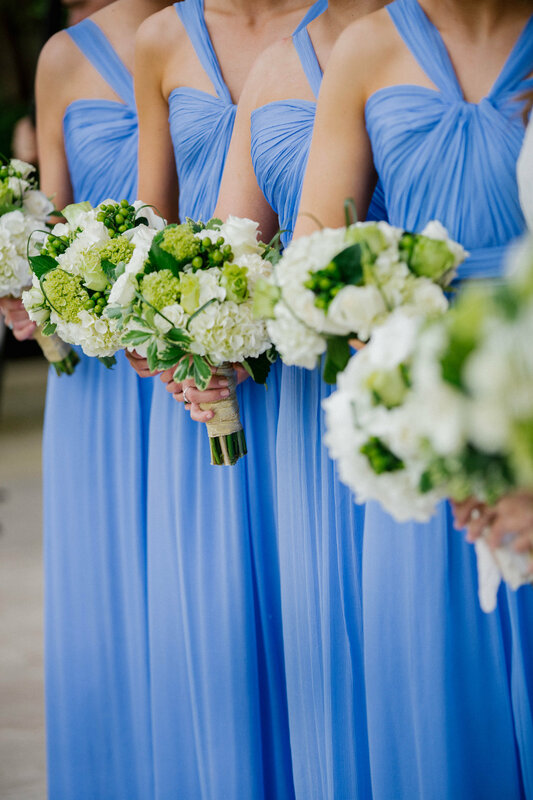 I chose gold, white, and hydrangea blue as my colors! 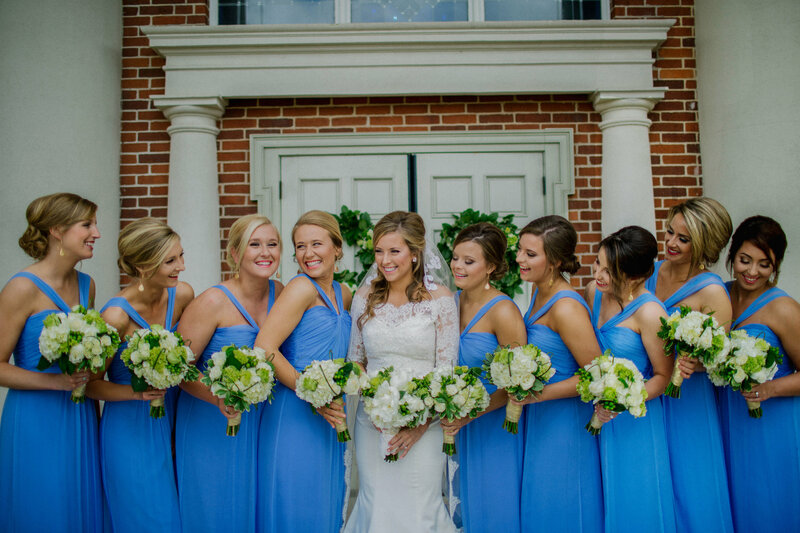 I allowed my bridesmaid dresses to be the pop of color against the guys’ traditional tuxes. 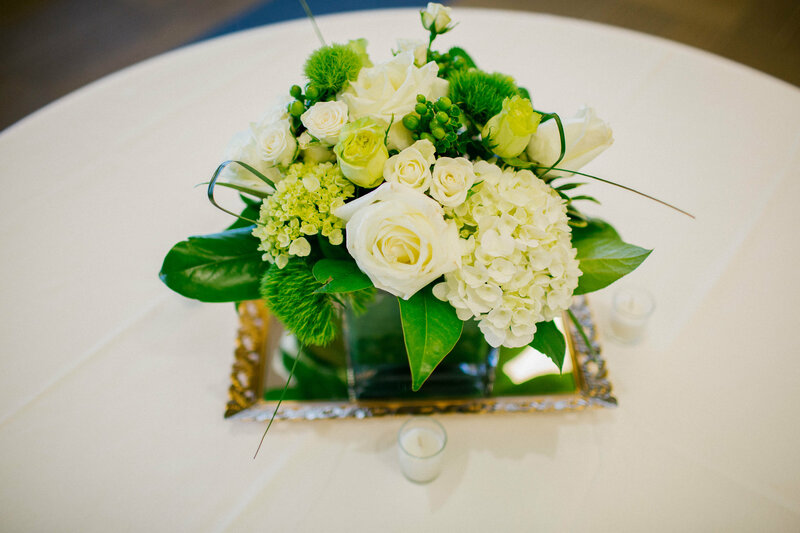 The flowers were a luscious combo of white and green roses, hydrangeas and peonies! I LOVED the bridesmaid dresses that I chose! I am secretly hoping to borrow one from my girls for the next event I have to go to! The first time I went to Bella Bridesmaids, I thought I knew exactly what I wanted, a purple-pink color, and style that looked good on everyone and covered everyone up top. 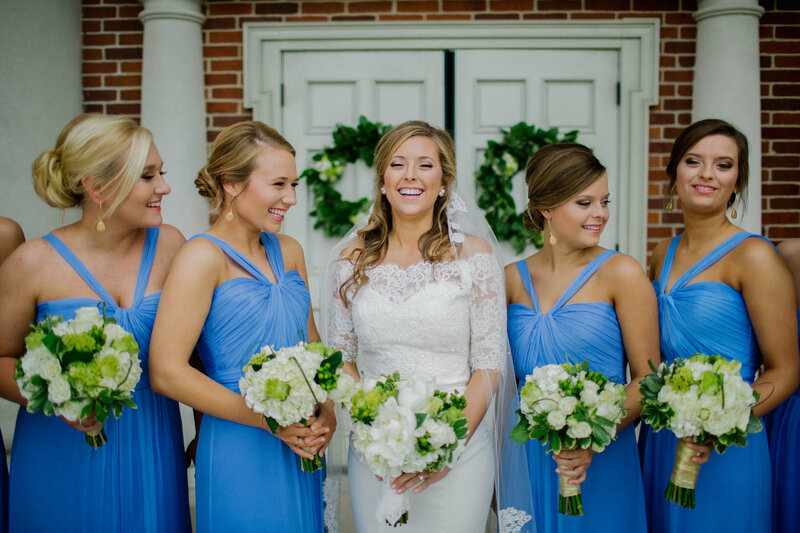 I brought about 6 of my bridesmaids with me and boy did it get chaotic. I totally rushed my decision… I chose I think a Jim Hjelm dress, but second guessed it for a month. My best friend told me if I thought about it again, we were going back to look for a second time. I am so glad that we did! I ended up choosing something totally different. Leigh and Stephanie at Bella in Shreveport were fabulous. They were so patient with me! I showed them pictures I had seen of past bridal parties on Instagram and they knew exactly which dresses and colors I was looking for. I ended up choosing an Amsale crinkle chiffon floor length dress in hydrangea! I am still in love with them! Since then, Leigh and Stephanie have been amazing help to many of my friends that are recently engaged. I am excited every time I get to go to the store! 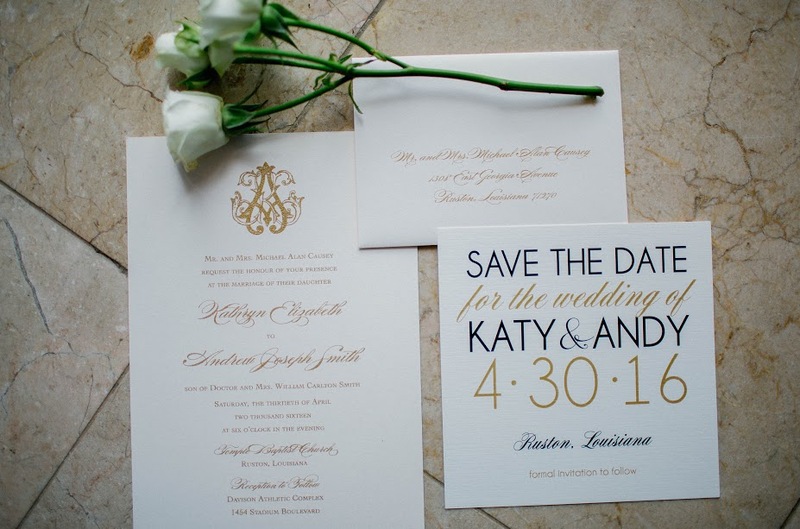 I just love southern class and timeless tradition! Just simply for my personal style… My must haves would be a live band, a Louisiana second line, and a black and white dance floor. Those will definitely help get the party started!